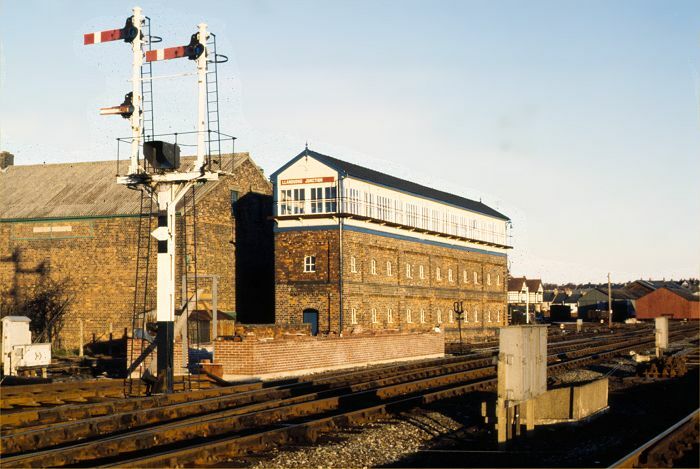 Christmas Day 1979 - no trains to photograph, but an opportunity to get a shot of Llandudno Junction signal box from an unusual angle. Built in the 1890's when the station at Llandudno Junction was relocated and expanded, this was a London and North Western Railway standard size 'T' signal box. Originally 80'4½" long, it was extended by a further 7'9" in 1923 and had 150 levers. It was one of three signal boxes in use at the time at the Junction, and was numbered No 2. In front of this triumph of Victorian design (described in one book as "one of the most successful applications of prefabricated building techniques ever"), there lurks its nemesis. This is the base of what was to become the new Llandudno Junction signalbox. Interestingly, it was originally constructed as a relay room, complete with flat roof, with the upper storey being added later - possibly when it was realised that the new road bridge would restrict the view of the station. The new box has one claim to fame - it has become the last of the London Midland Region standard type of signal boxes to be built. All images on this site are copyright Dave Plimmer © 2002-2018 and may not be reproduced in any form without prior consent.